There is not much in the way of deals out there, but my average dividend yield metric shows that BAX, ESV, IBM, OXY, NOV and TGT are at decent prices. As reported earlier this week, I added to my position in Baxter and initiated a position in Accenture. Also this week, Baxter increased its quarterly dividend to $0.52 from $0.49, or 6.1%. And Telus increased its 2014 quarterly dividend for the second time in 6 months, for a total increase of $1.36 to $1.52, or 11.8%. On Friday, I bought 25 shares of ESV and now hold 275 shares. The share price is very cheap, the dividend yield is excellent, and as far as I can tell, there is nothing wrong with the company. My yearly dividend income now stands at $6,073.59 and I’m sitting on $17,850 in cash. Going against the heard mentality has served us well. I’m hoping for a repeat. We also like BAX, ESV, and also thinking of adding to our TGT position. We agree that all three are at decent prices right not. I've been watching RIG and ESV closely but favor ESV because their equipment is newer. In their business, with maintenance being a large part of their overhead, I think ESV is the better buy long term. As for TGT, they were high but with the recent pull back from the announcement of their CEO leaving, I think TGT has a much better entry YOC now. Way to go with your $6K in dividends! Wish you continued success. When the CEO was pushed aside, I thought TGT was going to tank. Remarkably, it has held up nicely which may mean a lot of bad newws is priced in. I'm thinking this year's dividend increase won't be very high, but if they can correct issues wrt their entry into Canada, the future is bright. Thanks for visiting. I look forward to reading your blog for new ideas. 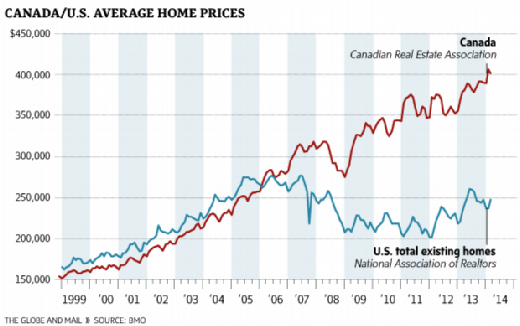 That Canadian real estate chart is a bit scary! I think it's a smart move to sit on the sidelines and rent. What do you think is attributing to this "bubble like" market? The bubble seems to be caused by several factors. 1. 5 year fixed mortgage are being offered at 2.99% per year. 2. 5% cash down is all you need; some financial institutions give you 5% cash back, so you're effectively buying with 0% down. 3. Banks are lending to anyone that has a pulse. - If you have less than 20% down, you must insure your mortgage through the Government of Canada (i.e. the tax payer). There is no risk to Banks. 4. People feel entitled and are just plain house horny. It's the buy now or forever be priced out mentality. House ownership in Canada is 70% - it used to be in the low 60's. Talking to people in my entourage is scary. Everyone says house prices are sky high and yet several have bought houses in the last 2 years. No one I know believes real estate in Canada will crash. I sold an income propery in 2008 because I thought real estate was severely overvalued. And it has only gone up since! When interest rates go up and houses have come down some 30-40%, I'll happily put someone out of their misery. That's some nice annual dividend income coming your way. I see you and many other bloggers out there are into TGT. I know it has been beaten down a bit recently but I just can't see a long term hold for many of the retailers. Just my 2 cents. Thanks for sharing your portfolio with us too! There is no disputing that TGT is having a rough time. And I believe it will take a couple years before we see a turn around, if one comes about. I appreciate managements mea culpa and hope they have taken the right steps to correct the issues. Wow.. that's some telling graph. It's amazing how the two markets correlated perfectly for so many years till about 2006. Impressive yearly dividend income as well. Good call on ESV. Seems to be poplar these days among the dividend bloggers. Canadians are spending way too much on housing and I believe it's going to bite us, hard. I would have bought more ESV, but it already represents a good chunk of my portfolio. Seems very shareholder friendly.